The second conference day was opened by Bernhard Krüsken, Secretary General of the German Farmers' Association. His speech pointed out the question: "Urban farming and classical agriculture - competition or partnership", which he answered very clearly: Partnership. For him, it is a matter of peaceful coexistence and mutual complementarity between the two production methods. - Bernhard Kowatsch, Head of the Innovation Accelerator of the UN World Food Programme. In his lecture, he reported on how new ways of thinking, new solutions and cooperations with start-ups can help to combat hunger in the world. - Dr. Michael Binder, Director Sustainability Development at Evonik Industries, emphasized the importance of applying systemic thinking when developing and implementing new food solutions. In his opinion, changes in input or output always have an impact on the entire system and need to be taken into account. - Prof. Justus Wesseler, Professor of Agricultural Economics and Rural Policy at Wageningen University, Netherlands, spoke on urban agriculture and asked what is left of conventional agriculture. - Associate Professor Dr.-Ing. Nannan Dong, Deputy Dean at the College of Architecture and Urban Planning (CAUP) of Tongji University in Shanghai, showed to what extent the topic of "Urban Farming" and "Rooftop Gardening" is being driven forward from initial project studies and architectural solutions to large-scale projects in China. - Henk Wolfert, Programme Manager Research at the Amsterdam Advanced Metropolitan Solutions Institute (AMS), presented the institute and its projects in the food and environmental service sector. - Barbara Swartzentruber, Executive Director of Strategy, Innovation and Intergovernmental Relations, and Cathy Kennedy, Manager of Policy and Intergovernmental Relations of the City of Guelph, presented their vision for the city in the Canadian region of Ontario. Their goal is to become Canada's first city with a circular economy. - Peter Verstrate, CEO Mosa Meat from Maastricht, reported on the company's origins and also made it clear that meat consumption does not only entail ethical or moral problems, but also a very practical one: the land necessary for food cultivation is limited. - Dr. Andreas Blüthner, Director Food Fortification & Partnerships, BASF, addressed the development of the world's population and reported on BASF's Food Innovation Cluster for Africa. The cluster brings together various players along the value chain with the aim of improving the food situation in African countries. - Dr. Georg Schirrmacher, Managing Director of the European Institute of Innovation and Technology (EIT) Food Co-Location Center (CLC) Central in Munich/Freising, called for groundbreaking innovations in the food sector and stressed the important role of initiatives such as EIT Food. - Dr. S. M. Abdul-Awal, Professor at the Department of Biotechnology and Genetic Engineering at Khulna University, Bangladesh & Fulbright Scholar & Beahrs ELP Alumni at the University of California, Berkeley, addressed in his speech agriculture in Bangladesh and stressed the need for agricultural alternatives due to special weather conditions. - In his speech, Alexander Franke, Manager Business Development & Innovation at K+S KALI GmbH, presented how das supports initiatives in urban agriculture. 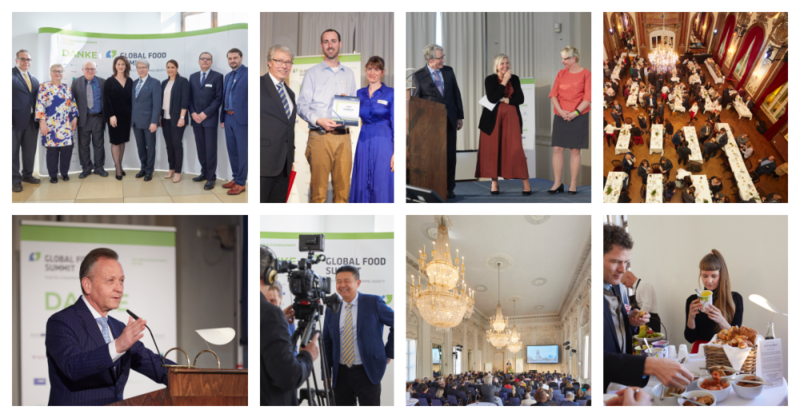 A summary of the speakers at the Global Food Summit can be found here.